I have been home for two days, but I still have my recent vacation on the brain. I hate the reason the vacation happened, but I LOVE that it happened. I spent time with old friends, met some new ones, and we had a TON of fun. There were tears, but way more laughter. I will cherish those memories forever! 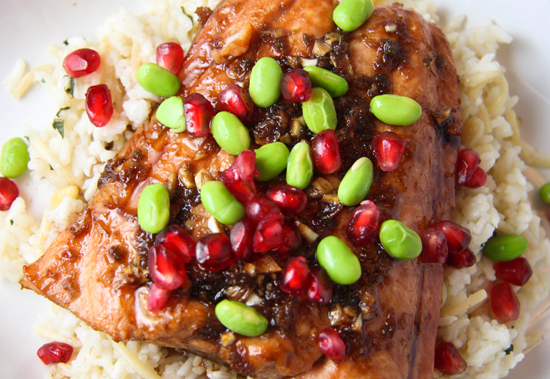 This Pomegranate-Glazed Salmon recipe is good! Actually, it’s delicious. This is a colorful and festive recipe includes fresh ingredients and flavorful spices. Pair this with a simple side dish and dinner is served! This was a good recipe to start with because, well, it was good! Delicious, actually. And so very colorful and festive. It was a healthy way to start the new year! 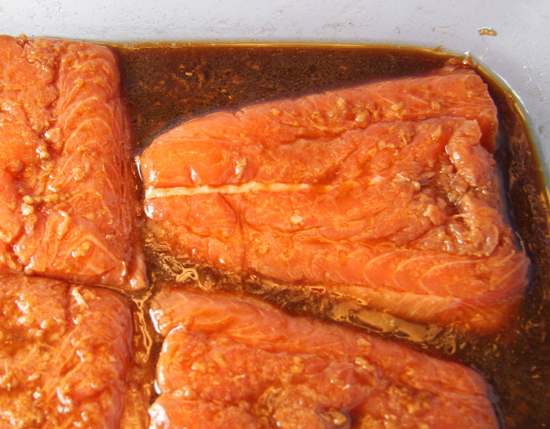 First, you will need to prepare a marinade for the salmon. Plan on at least an hour for marinating. Mix well and place in a shallow baking dish. Add eight 6-oz. skinless salmon fillets to the dish and coat with the marinade. Cover and refrigerate for 1 hour, turning fish a few times. 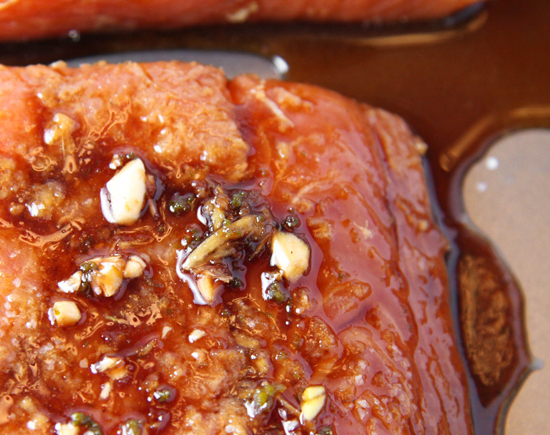 While the salmon is absorbing all of those delicious flavors, prepare the glaze. When the salmon is done marinating, preheat your broiler. Transfer the salmon to a rimmed baking sheet. Season with salt and brush with half of the glaze. Broil 4 inches from the heat source for 3 minutes, until the fillets begin to brown. Brush with the remaining glaze and broil for 3 additional minutes, until salmon is richly glazed and just cooked through. Garnish with shelled edamame and pomegranate seeds. Colorful, festive and so very good! PREPARE THE SALMON: combine the soy sauce, olive oil, lemon juice, lime juice, agave nectar, garlic, ginger, salt and white pepper in a large, shallow dish. Add the salmon fillets and turn to coat. Cover and refrigerate for 1 hour, turning a few times. 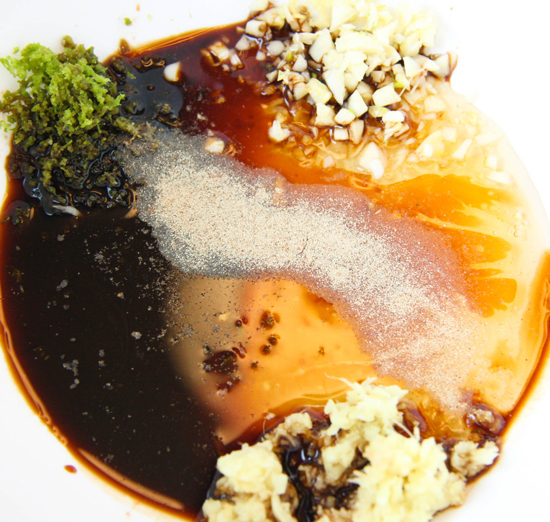 MAKE THE GLAZE: Meanwhile, in a medium bowl, whisk the pomegranate molasses with the agave nectar, soy sauce, garlic, ginger and lime zest. Preheat the broiler. Transfer the salmon to a rimmed baking sheet. Season with salt; brush with half the glaze. Broil 4 inches from the heat for 3 minutes, until the fillets begin to brown. Brush with the remaining glaze; broil for 3 minutes longer, until richly glazed and just cooked through. 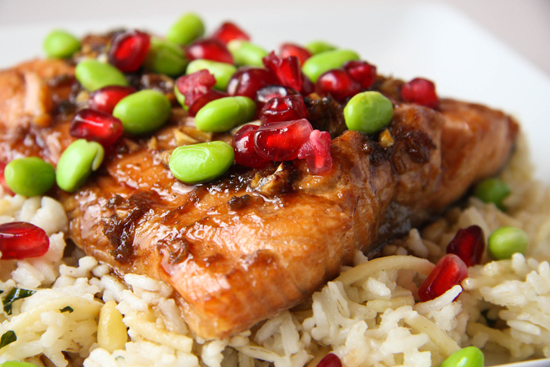 Garnish with edamame and pomegranate seeds.